The DP301AN is a low-cost 3-1/2 digit DC voltmeter. It fits in a standard 1/8 DIN panel cutout and require a depth of less than 104 mm (4.1") behind the panel. With the addition of a screw-terminal barrier strip, it becomes a low-cost, pin-compatible alternative to the DP2000A and DP2000B in applications where indication-only is required. The DP301AN offer voltage ranges of ±0.1999V, ±1.999V, ±19.99V and ±199.9 Vdc. The input is true-differential, with excellent common-mode noise rejection (CMR). By using an external DC voltage reference, any of these ranges can further be configured for 3-wire ratio measurement with readout from 0 to 1.999. The DP301AN can be configured for four voltage input ranges, three decimal-point positions, and high-impedance 3-wire ratio input. Mechanical options include a screw-terminal barrier strip for signal and power and a splash-proof lens cover which meets NEMA 4 (IP65) standards. 3-1/2 digit voltmeter, ±19.99 Vdc input range,115 Vac, 50/60 Hz power with D4 connector / screw terminal barrier strip. 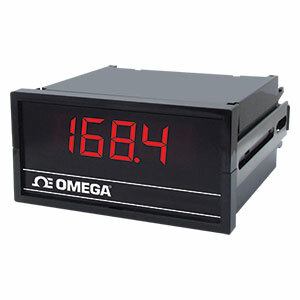 3-1/2 digit voltmeter, ±199.9 Vdc input range,115 Vac, 50/60 Hz power. 3-1/2 digit voltmeter, ±199.9 Vdc input range,115 Vac, 50/60 Hz power with D4 connector / screw terminal barrier strip. -D4 for Screw-terminal barrier strip for power and signal (removes power and signal from D1).